While you may not have heard of the herb gravel root, there are in fact over forty species of the genus, many of them used medicinally. Although parts of many herbal traditions throughout the world, you can find the flowering plant growing in North America from Canada to Florida in mostly wet, wooded areas. There are a number of interesting legends associated with this herb, too. For instance, it is said that the genus name Eupatorium was derived from King Mithridates Eupator, who was king of Pontus and Armenia Minor in northern Anatolia (now Turkey) from about 120–63 BC. He is reportedly the first to use the plant as an herbal remedy. In Native American history, legend has it that the common nickname for gravel root, Joe Pye, stems from a Native American with the same name. As the legend goes, he used the herb to help cure a typhoid outbreak. The Iroquois called a decoction of gravel root "little medicine water" because of its healing properties. Today, it is often used as a good luck charm. While the history of the plant is certainly interesting, what it's most noted for is its use in treating urinary tract problems such as urinary or kidney stones; infections of the bladder, urethra, and prostate; and painful urination. In fact, the name gravel root is based on its use for kidney stones (gravel). 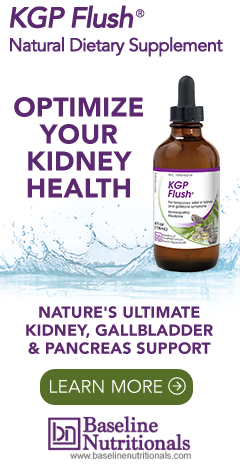 You'll even find this as an ingredient in Jon Barron's KGP Flush, a powerful cleansing/detox formula for ultimate kidney health. Like chanca piedra and hydrangea, gravel root not only exhibits anti-lithic (kidney stone dissolving) properties but also diuretic properties. In addition, it helps with cystitis, dysuria, urethritis, and pelvic inflammatory disease. The herb also tones the reproductive tract and is used to treat inflammation of the prostate. It can also play a role in the systemic treatment of rheumatism and gout, as it encourages excretion of excess uric acid. WebMD confirms gravel root's use in treating gout, and then goes on to say it can be used "for fever from malaria, dengue virus, or typhus. Gravel root is also used to reduce stomach acid, increase urine flow, cause vomiting, and cause sweating; and as a stimulant and tonic." Typically, the bulb, root, and parts that grow above the ground are used to make medicine. And it can be found medicinally in tea, pills, and tinctures. There are some poteintial issues with gravel root. Stomach pains and liver problems can occur if used in excess. In addition, the plant is a member of the aster family, which is known to cause allergic reactions in many individuals. Although allergies are less likely with gravel root, it would nevertheless be advisable to consult with a doctor before using gravel root if you have a known allergy to ragweed, marigolds, daisies, or other aster family plants. For more natural kidney care herbs, click here. Nice article about popular location. I finally thinking on my travel (to Turkey), so provided material will be helpful. Cheers! Challenged to kidney function sharing with spine gout: from diabetes and Titanium Implants restoring function from ACL, MCL, & meniscus (in sports medicine double diamond fall;) my life is changed with KGP_Flush...and the memories thankful of being reminded to concern from others; competent physicians.